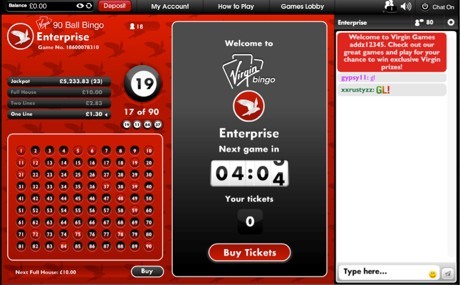 Enjoy a classic game of Bingo 90 at any time of the day with plenty of exciting offers in Virgin Games' Enterprise room. You can buy up to 36 tickets for each game of Enterprise Bingo. After buying your tickets you can continue on with your day as the game will automatically keep track of your tickets and will award you any prizes you have won in your absence. ‘Quick Buy’ allows you to buy tickets for the next Enterprise Bingo game. Click ‘Buy Tickets’ and you will be presented with the available tickets for the next game. You must select the number of tickets you'd like to purchase. Click ‘Buy’ and then confirm to complete your purchase. The ticket prices from 5p to 25p. Each game of 90-ball bingo features a Progressive Jackpot. This jackpot can be won by completing a full house in 40 calls or less. This event occurs quite rarely, which means that this jackpot can grow to huge amounts of money. A new bingo game will start every five minutes, so once you have bought your bingo tickets you will be playing a game in no time. A Community Super Jackpot is a fixed cash prize which is won by calling ‘house’ on a selected bingo games within 38 calls. A percentage of the prize will then be awarded to the player who called ‘house’, while the remaining amount is divided equally between all players who held a ticket in the winning game. Super Jackpots range from £5,000 up to £25,000.